Bosses are like diapers — always on your as- and full of sh-t.
Is that the attitude you have about your boss? 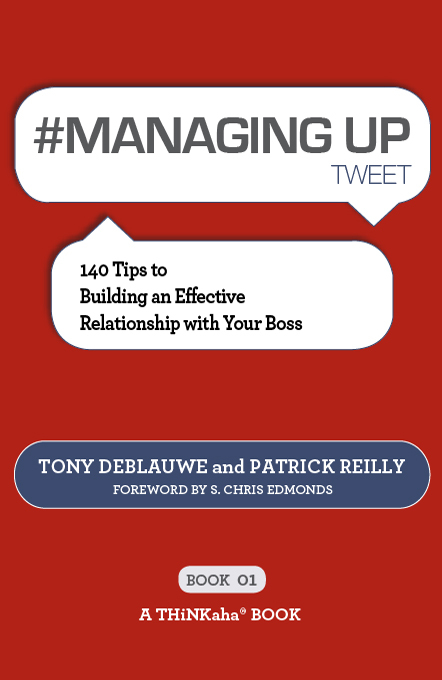 If so, then you really need to read #MANAGING UP tweet Book 01 — 140 Tips to Build An Effective Relationship With Your Boss by Tony Deblauwe and Patrick Reilly. It will not only change your attitude about your boss but will also help you use that relationship to your advantage. Most of us spend more time interacting with our boss than our significant others. This makes our relationship with our boss a critical component to our professional success. That’s the reason why #MANAGING UP tweet is so effective — it gives us the needed tools to build a better relationship with our boss quickly and effectively. It’s a fallacy that we can’t impact our boss. In fact, each and everyone of us has a tremendous impact on our boss — we just need to make that impact benefit us. If you find yourself in need of a great handbook on building a better relationship with your boss, then check out #MANAGING UP tweet — it’s a quick read and chalked full of useful and actionable information.